Present state: A large warehouse occupies the site of the station building, platform and goods shed. 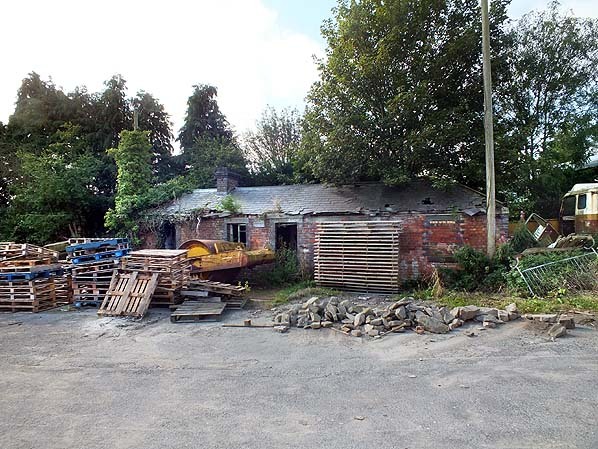 The only surviving railway building is the weighbridge office just inside the former entrance to the goods yard. The entrances to both the goods yard and the station can still be identified. Bishop's Castle station was the terminus of the line and the headquarters of the Bishop's Castle Railway Company; the station opened on 1 February 1866. Considering that Bishop's Castle was the most important station on the line serving the largest community it had only a very modest timber-fronted brick building with a sloping slate roof, and the very narrow canopy offered little or no protection to waiting passengers. A small brick extension was added in later years. The building stood at the back of a 200ft platform on the down side of the line. Opposite the platform was a run-round loop. 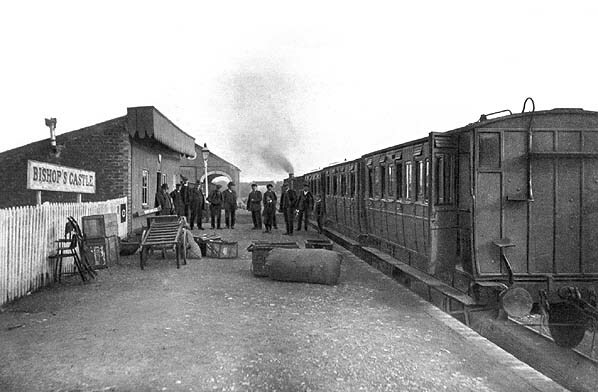 At the end of the line was a small turntable, but this was later replaced with a single-road timber engine shed which remained in use until the line closed. 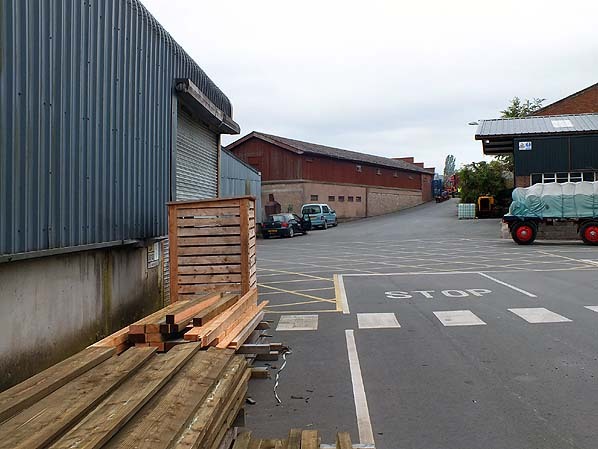 Adjacent to the engine shed was a single-road timber carriage shed. pens close to the western perimeter of the goods yard. A small turntable was located at the end of the siding adjacent to the carriage shed. A weighbridge was sited just inside the entrance to the yard on Station Road, south of the passenger entrance. 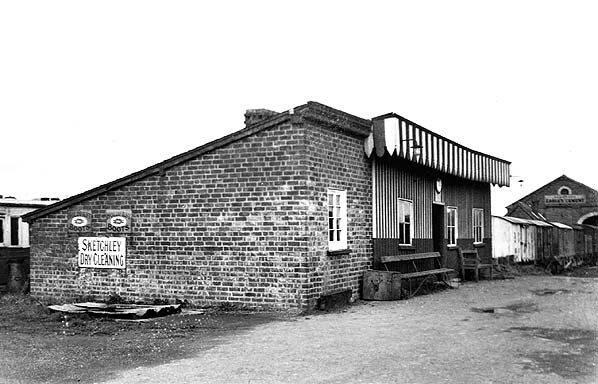 The weighbridge office is now the only surviving railway building on the site. A 6-ton crane stood in the goods yard, matching those at Lydham Heath and Plowden; it was needed to handle the large quantities of timber despatched from the station. Two coal merchants, Beddoes and Gwilt, operated from a coal depot in the yard. Bishop's Castle also handled a considerable amount of livestock. One or two cattle trucks would be attached to the train on alternate Mondays conveying farmers' sheep and cattle to Craven Arms mart. Livestock traffic was two-way, with local butchers returning on the last train from Craven Arms on these Mondays with cattle and sheep which would be unloaded on the passenger platform after the passengers had departed; they would be then driven to the various slaughterhouses in the town. their dogs in the guard's van. Special trains for the sheep sales and March and October cattle sales would leave Bishop's Castle when trainloads would be made up; any remaining wagons were then forwarded with the normal service. 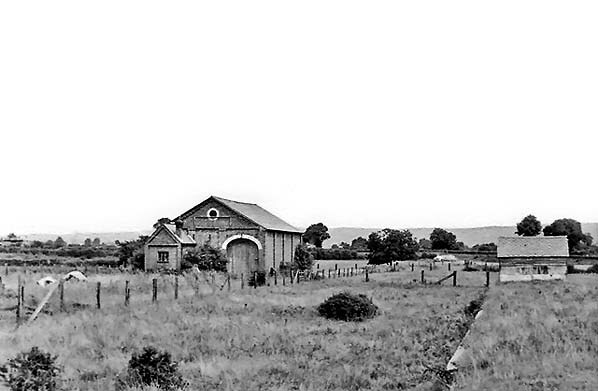 After closure in 1935 and track-lifting in 1936 the station remained largely intact, although the timber engine shed and carriage shed were probably quickly demolished. In the 1950s a saw mill took over the site. 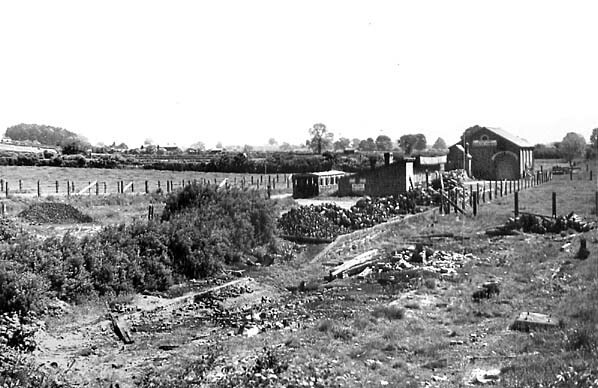 Although the buildings (with the exception of the goods shed) had been demolished, the platform lingered on into the 1960s but was eventually covered over when a warehouse was built on the site. This, in turn, was demolished to make way for the current larger warehouse. At that time, a section of the platform was uncovered. It was covered with thick plastic sheeting before concrete for the base of the new building was poured over it. 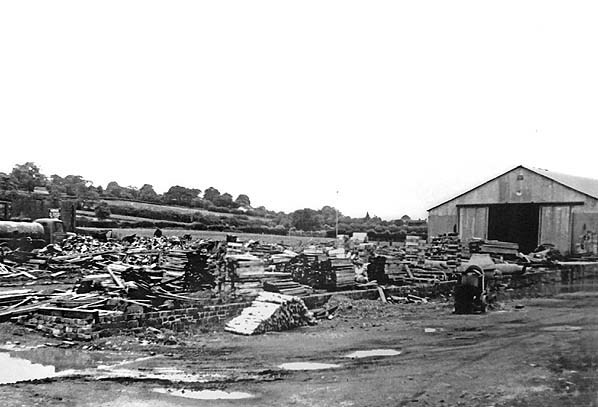 Ransfords & Son Ltd timber merchants and sawmillers, still occupy the site today. 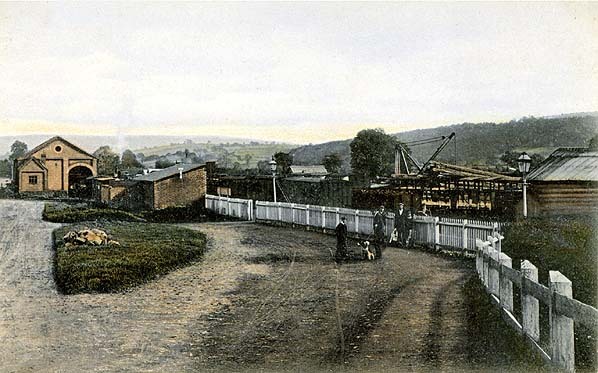 In 1860 a railway to link Bishop's Castle with Craven Arms was first mooted when a group of local tradesmen devised a plan for an 18½-mile single-track line to run from the Shrewsbury and Hereford line at Craven Arms to join the Oswestry & Newtown Railway (later to become the Cambrian Railway) near Montgomery, with a short branch to Bishop’s Castle. Plans for the line were deposited at Shire Hall, Shrewsbury, and the entire route was surveyed later that year. 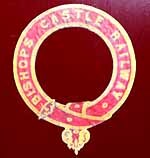 The Bishop's Castle Railway Company (BCR) was established in June 1861, and the following month the company received Royal Assent for the construction of their line. Further surveys were completed early in 1862, and the company started to purchase land prior to construction. Oswestry-based contractor Thomas Savin was hired to build the railway; in his career Savin built at least ten different railways in Wales and the border area. Having taken an advance payment of £20,500, construction started in March 1863 but ground to a halt almost immediately as Savin was in financial difficulties. This was a gloomy portent of what was to come, and the company was forced to pursue its contractor into Chancery in the summer of 1864. Thomas Savin eventually declared himself bankrupt in February 1866.
second Act, The Bishop’s Castle Railway (Deviations) Act, was obtained in 1865. This authorised a further branch from Chirbury on the BCR to Minsterley which would give more direct access to Shrewsbury. By October 1865 the 9½-mile section from Stretford Bridge, where the line made a junction with the S & H a little north of Craven Arms, to Lydham Heath and the ‘branch’ to Bishop’s Castle itself was complete. The planned triangular junction at Lydham Heath had not been built (and never was due to lack of funds) and there was only a north-facing junction which meant that all trains stopped at Lydham Heath, where the locomotive had to run round the train before completing its journey to Bishop’s Castle. Despite these awkward junction arrangements the company decided to open the line to passenger traffic immediately, before Bishop's Castle station had even been built, and without waiting for the Board of Trade inspection - which was a legal requirement. The formal opening was on Tuesday 24 October 1865, when a large crowd gathered at Bishop's Castle to see a locomotive and 11 coaches, probably borrowed from the Mid-Wales Railway for the occasion, and laden with shareholders. and Horderley; it is unclear if these stations actually opened with the line. A further station at Stretford Bridge, close to the junction with the Shrewsbury & Hereford (LNWR & GWR Joint from 1870) opened in 1890. There were four trains a day in each direction with the fastest journey time of 30 minutes. Some trains, however, took up to 50 minutes, running at an average speed of 12 mph! London with debts totalling £11m. 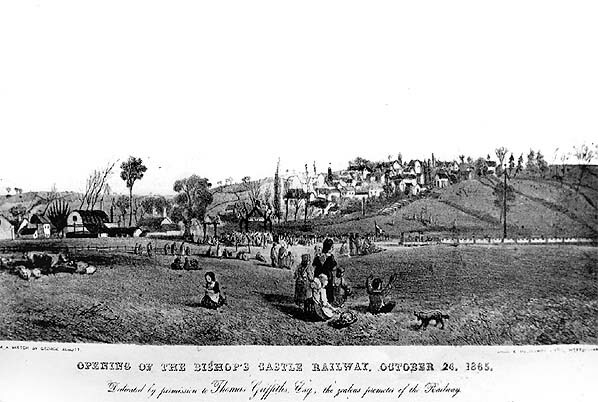 Many small railway companies with lines under construction were badly hit, including the Bishop’s Castle. The two extensions to Montgomery and Minsterley were scrapped, but this was not sufficient to save the line which was now close to bankruptcy. By the end of the first year the infant railway was bankrupt. From that time the company’s long life under the receiver began. Not for the last time bailiffs descended on the line and, while the train service was allowed to continue under supervision, most of the assets were seized and offered for sale by auction at the George Hotel in Shrewsbury on 23 January 1867. The total sum realised by the 61 lots was £3,522, the Midland Waggon Company, being the principal purchaser. Although the creditors were paid, the Bishop's Castle Railway remained in permanent receivership. The total sum realised by the 61 lots was £3,522; the Midland Waggon Company, being the principal purchaser. Although the creditors were paid, the Bishop's Castle Railway remained in permanent receivership. Despite its shaky start, the Midland Waggon Co. and the debenture shareholders were convinced of the line's potential and were content for it to continue to operate under the receiver. Following the auction the rolling stock was immediately leased back to the BCR. having been obtained the matter was placed in the hands of a Sheriff who, however, could find no further property to seize. The Bishop’s Castle receiver was curiously impervious to any demands for money, it would seem, and the line continued to operate strangely immune to judgment or regulation. convenience and the loss to him of a few acres of land was of little consequence. After Beddoes death, his wife took a different view and pressed for the money, eventually taking the company to court for the £800 that had never been paid. She won her case and, when the outstanding debt was not settled by the BCR, bailiffs were called in. between Bishop's Castle and Horderley, where passengers transferred to horse-drawn coaches to take them to Craven Arms. on them for their cold and lonely job. The visitors suggested a drink at the village pub, the Lion Inn, and the bailiffs readily agreed believing there was no chance of anyone trying to reinstate the line at that time of night. A gallon or two of mulled beer, tempered with a drop of gin, was served in front of the blazing fire. This seemed to suit the bailiffs better than keeping watch on a cold night. In the meantime a gang of men had placed the rails back in position and, soon after, an engine with all the empties crept quietly down from Bishop’s Castle into Craven Arms, picked up a train load of goods and coal, and steamed off at full speed towards the beleaguered town. By this time the bailiffs had recovered a little, in fact, sufficiently so to hear the engine. They ran out of ‘The Lion' shouting and trying in vain to stop the train as it sped by. They had been outwitted, and the goods and coal were safely unloaded at Bishop’s Castle. The lawyers threatened the manager with arrest, but he was able to prove an alibi. After this incident the Bishop’s Castle Railway was allowed to continue to operate although the first mutterings against the management of the receiver were beginning to be heard. A takeover by the GWR was suggested together with the revival of the original aims to open through to Montgomery. The problem of the Beddoes’ land was solved through a rental arrangement, and another `celebratory (re)opening’ took place on 2 July 1877. Further threats to the railway arrived at frequent intervals. It was peculiarly vulnerable, of course, through its odd legal position; inheritors of the shares and interest and debts incurred from the 1860s did not look on the line as compassionately as their fathers. Court cases, and the threat of them, were ever present. purchase of the Bishop’s Castle, was being actively discussed by the MP in London, though a more attractive alternative had surfaced. Suggested by the Reverend Prebendary White, vicar of Church Stoke, this envisaged a continuation from Lydham to Montgomery but via Kerry and Newtown. On 13 March 1903 it was revealed that all litigation was at last at an end, and the Bishop’s Castle Railway, now free of legal entanglement, was already the object of a ‘syndicate sitting in London'. It would purchase the line and extend it either to Montgomery, to Welshpool or to Newtown (via Kerry). Great things were predicted. However Jasper More died at the end of November 1903, and this signalled an end to much of the active campaigning for extension of the line; his indefatigable effort to promote the prosperity of the district was also at an end. but this came to nothing although talk of the extension staggered on through the early 1920s; the Great Western sensibly fended off a recommendation by the Council that it should take an interest in the ‘direct Montgomery’ route. By this time the service had been reduced to three trains a day in each direction. The Bishop’s Castle Railway was still bankrupt and unwanted and as such would probably have 'gummed up the works' of the Grouping Bill. It therefore remained independent at the establishment of the 'Big Four' in 1923. The Grouping seemed to render the Bishop’s Castle even more of an anachronism long before the next closure crisis, in 1930/31. In the House of Commons the new Ludlow MP, Col. Windsor Clive, asked the Minister of Transport, Herbert Morrison, if he proposed to take any action on a resolution of Bishop’s Castle Borough Council that the Great Western should take over the line. Having already consulted with the GWR, Morrison stated that upon ‘careful consideration’ he did not propose to promote legislation for the compulsory transfer of the railway. disbanded although The Defence Trust was still in existence, presiding over dwindling funds. By now, the closure threat had become perennial, and all suggestions of extensions to Montgomery or elsewhere had been forgotten. In May 1933 the council expressed ‘the profoundest apprehension and dismay’ at the latest threatened closure stating it would raise the price of all the necessities of life, inevitably cause further unemployment, handicap farming locally, possibly kill off altogether the local cattle market and bring further rural depopulation. Through all the threats and upsets, closure was stalking the line throughout its life, but there was always hope - almost an assumption - that somehow things would work out. From the early 1930s this changed, and a feeling of inevitable finality, a resignation to closure, took hold. but withdraw the receiver. This they duly did on 8 April, to be later confirmed by the Master of Chancery. The end for both passenger and freight traffic was fixed for Saturday 20 April 1935. Rural bus services had started in 1900, and it was road transport that eventually dealt the railway its death blow. The final demolition train left the line at Stretford Bridge Junction on 21 February 1937. Most of the rails went as scrap metal to Birkenhead where they were used by the Cammell Laird shipyard in the construction of HMS Prince of Wales. So effectively a piece of the Bishop's Castle Railway lies to this day on the bed of the South China Sea! The easternmost stretch of line has been incorporated into the Onny Trail, forming a walk along the banks of the River Onny and across the fields where passengers stepped down to pick mushrooms. The course of the line is clearly visible today, well demarcated and forms a broad grassy walkway through sheep pasture or woodland trackway. Castle. Opening times are: Saturday and Sundays 14.00 hrs – 17.00 hrs from Easter to the end of September. Tickets from Michael Stewart. except 101, 159, 3461, 6162 & 8923 Brian Halford. Ephemera from Bishop's Castle Railway Society. Bradshaw Nick Catford, GWR timetable from Chris Totty. Route maps drawn by Alan Young. This engraving depicts the official opening of the line. This was before the Board of Trade inspection so no fare paying passengers travelled on this day. 1883 1:2,500 OS map. Two turntables are shown, but there is no engine shed. The building between the two turntables is a carriage shed. 1903 1:2,500 OS map. One of the turntables has been removed and replaced with a single-road engine shed. The goods yard’s 6-ton crane is also now shown. This 1960's map of the station site shows that the weighbridge and office (indicated with the blue arrow) and the goods shed are still standing. As the weighbridge is still marked as such (WB) it seems likely that it was still being used by the timber yard. In the early years of the 20th century a passenger train at Bishop's Castle is waiting to depart for Craven Arms. The goods shed can be seen at the far end of the platform. The people are likely to be railway staff posing for the photographer, rather than passengers waiting to board the train. Another posed view of railway staff at Bishop's Castle station in the early 20th century. Sidings were on both sides of the line, one passing thorough the goods shed and continuing to a point just short of the platform. Considering that this was the terminus of the line - and the company headquarters - the station was provided with a surprisingly small building. Passenger facilities must have been basic. 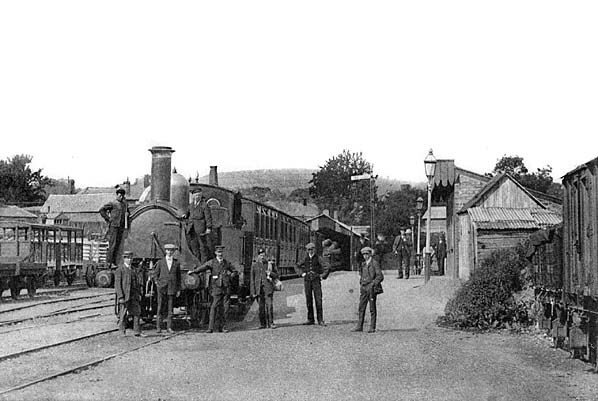 Yet another posed shot with staff gathered on the station in 1910 as a train prepares to depart for Craven Arms. The Bishop's Castle Railway had two locomotives. This is No. 1, built by the GWR at Wolverhampton works in 1869. It was a small 0-4-2T tank engine (517 class) designed by George Armstrong for local passenger work on the Great Western Railway and carried the GWR No. 567. After closure of the BCR, No.1 (Tanky) was put into a siding at Plowden to await cutting-up. The single-road timber engine shed is seen in the background. 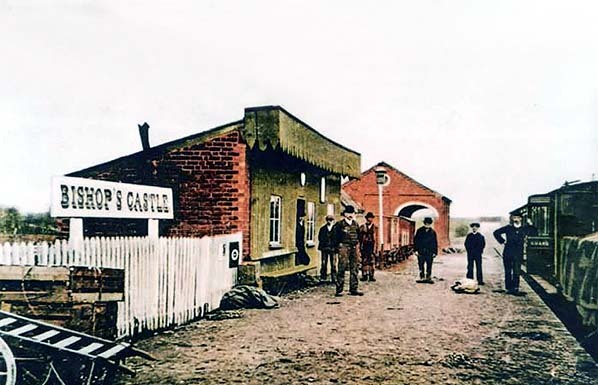 Bishop's Castle station forecourt c. 1908. The tiny station building is dwarfed by the large brick goods shed in the background. A mixed train stands in the platform. The station's 6-ton crane is seen loading timber in the yard in the background. Although the station is still open for both goods and passenger tracks, by 1928 it is looking very run down. Gone are the days when proud railway staff can be seen posing on the platform. The fencing at the back of the platform and the nameboard have been removed, but goods wagons still stand in the sidings indicating that the station is open for business. A carriage shed can be seen next to the engine shed on the left. At least the station building has received a coat of paint! The brightly painted station building at Bishop's Castle is seen in the 1930s. Comparison with earlier pictures shows that the building has been extended. The very narrow canopy must have provided very little protection from the weather. Bishop's Castle station c.1937. The track has been lifted, but the station is largely intact. building is an old bus. dock is seen on the right. 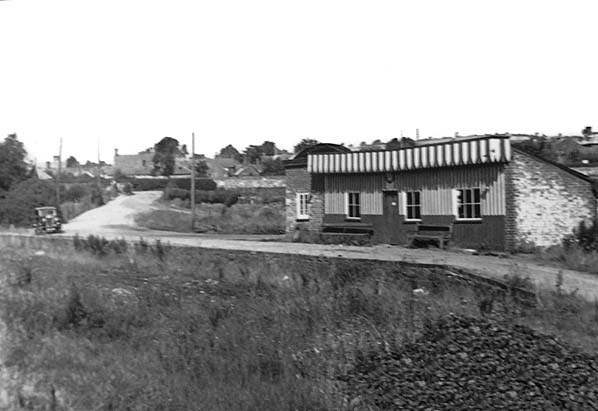 By the mid 1950s the station site was occupied by a saw mill and timber yard which are still there today. For a while the platform remained intact, but it was eventually covered with concrete and a warehouse was built on the site. When the warehouse was demolished to make way for the present building, part of the old platform was uncovered. Some restoration was done to the platform; it was then covered with thick blue polythene before being concreted-over again. Although the station and goods yard have been cleared, somehow the weighbridge office, just inside the goods yard entrance, has survived. It is likely that the weighbridge remained in use when the saw mill moved onto the site. It is seen here in September 2012. 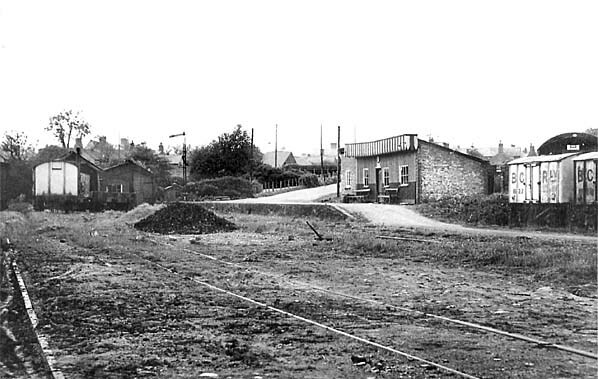 Apart from the weighbridge office, all other railway buildings on the site have been demolished. The building on the left stands on the site of the station building and platform. This view is looking up the slope towards the station entrance in September 2012. The entrance slope is seen clearly in the 1937 picture above.